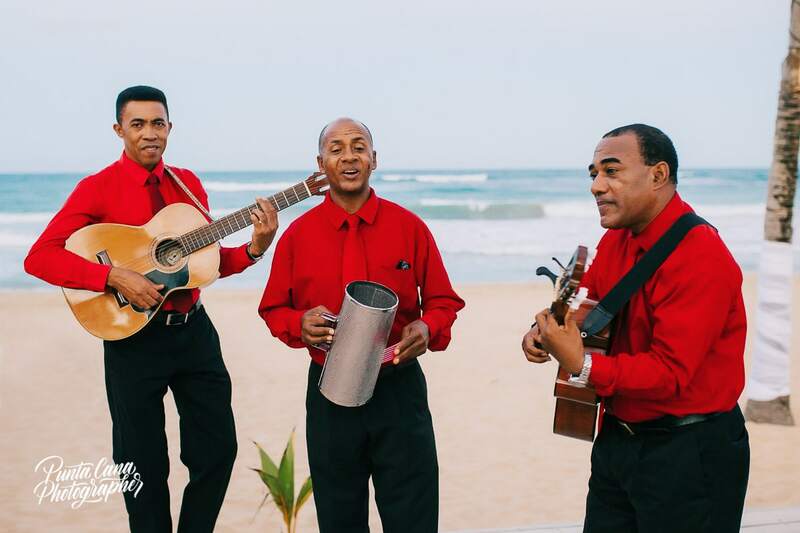 Are you interested in having a live band at your destination wedding here in Punta Cana? There’s a lot of people to choose from! Music is really important because it helps set the tone for weddings. So, before choosing a wedding musician, it is important to have a theme in mind. Do you want something upbeat and lively, smooth and jazzy; or perhaps something more mellow and romantic? We’ve become familiar with many talented musicians, and can recommend a couple based on your theme! All of these bands are based in Punta Cana! Pretty cool, right? If you’re looking for a sound that is smooth, jazzy, and romantic, then you might consider this amazing French Saxophonist based in the Dominican Republic. He is incredibly talented! We have really enjoyed listening to him perform at the destination weddings we have photographed. If you are considering a theme that is jazzy and romantic, then you should really consider him as an option. Everyone, including us, have given raving reviews, and we know that you will too! He can play a wide variety of wedding-appropriate songs including hits from Christina Perri and Ed Sheeran. He also offers performances as a Quartet, Trio, Duo, Solo, and can perform with a backing track or with a DJ. This talented musician is a must see! If you are looking for an authentic Caribbean sound, then the Caribbean Trio is an excellent choice. Their smooth Latin voices are both melodious and uplifting. You can’t help but smile when you hear their friendly voices. They may not be a group that you would dance to, but they are very talented, entertaining, and would make an excellent addition to your cocktail hour! If you are planning your wedding in DR and want your guests to listen to some typical rhythms like bachata they are your best choice. But they not only perform Caribbean music, they have a variety of songs that can be played during cocktail hour, the reception or even the ceremony. Just name a song and they will play it! From solo singers to live bands to DJ’s, Tonka Entertainment has everything to offer for your beach wedding. Why not have a live band play during your reception? This is a great idea to surprise your guests! From Bossa Nova bands to Rock Bands to Latin Bands you could just have the best reception of the year! This might be a great addition to your destination wedding, and one that no one would expect. Whatever style you are looking for to go with your celebration you can find it with them! There are a lot of talented musicians in Punta Cana, and we are sure that you will be able to find one that suits your needs and the needs of your wedding. Remember to always check the reviews, and don’t be afraid to check out their YouTube videos too. Happy wedding planning! If you want to impress your wedding guests here’s another post you should read! Read about these 9 ways to show your guests your appreciation!